Readers may be interested in keeping an eye on the Royal College of Physicians’ blog which plans to feature some posts on the Cork St Fever Hospital archive preservation and cataloguing over the next year. The first post in the series includes this engraving of the hospital, clearly a substantial building. 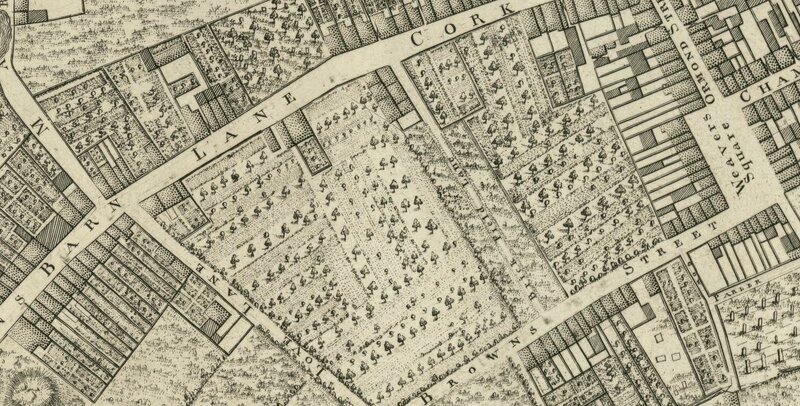 Site of Cork St Fever Hospital from Rocque’s map 1756. The site for the hospital was selected to be “Widow Donnelly’s Orchard”. It is unnamed, but clear on Rocque’s map that an orchard existed on the site of the hospital. The site is bound by Love Lane (now Donore Avenue) to the west and Brickfield Lane to the east. Construction began in 1802 and was complete by 1808. The hospital opened after the ward ranges were complete in May 1804. It clearly had immediate success: in 1805, 1028 patients were admitted from the hospital’s catchment area of south of the Liffey to the South Circular Road. 874 of these were “discharged and cured”, 97 died, and 57 were still in care at the end of the year. 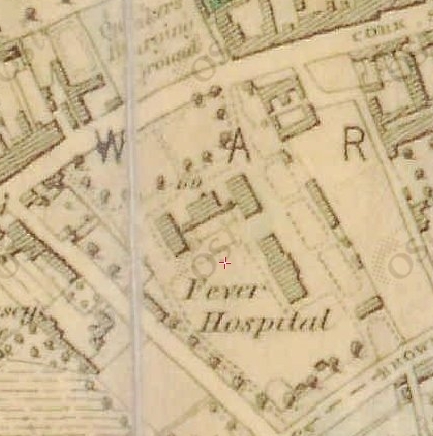 The fever hospital is visible from the early OSi map (ca 1840); and its foot print remains relatively unchanged today, save for an additional building in the south west of the complex. It is easy to see the relationship of the buildings in this map to the etching shown at the top of the article. E. Dudley (2009) A Silent Witness – Cork Street Fever Hospital, Dublin Historical Record, 62(1), 103-126. *An interesting article on Rev James Whitelaw and his Survey of the City is available on the Come Here to Me blog.